It may be a little known fact that many of the brave men and women who serve their communities as First Responders also have served our country in our Armed Forces. 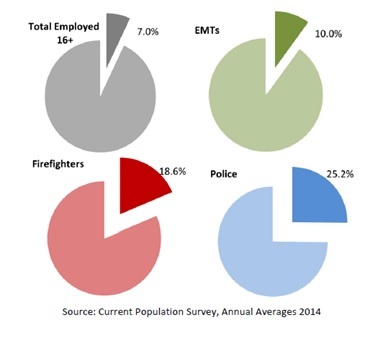 The U.S. Department of Labor published a report on the Characteristics of Individuals and Employment Among First Responders1 (revised August 6, 2015) that shows that 1 in 4 police officers, nearly 1 in 5 firefighters and 1 in 10 EMTs are veterans. Putting that in perspective, of the 1,005,0222 sworn police officers in the US, roughly 253,265 are veterans; of the approximately 1,140,7503 local firefighters in the US; 212,179 of them are veterans; and of the 253,7604 EMTs in the US; 23,579 are veterans. These numbers become even more significant when considering that the entire US veteran population is only 7% of all employed Americans. Honor is the bedrock of our character. It is the quality that empowers Marines to exemplify the ultimate in ethical and moral behavior: to never lie, cheat, or steal; to abide by an uncompromising code of integrity; to respect human dignity; and to have respect and concern for each other. Courage is the mental, moral, and physical strength ingrained in Marines that sees them through the challenges of combat and the mastery of fear, and to do what is right, to adhere to a higher standard of personal conduct, to lead by example, and to make tough decisions under stress and pressure. Integrity is a character trait. It is the willingness to do what is right even when no one is looking. It is the moral compass, the inner voice, the voice of self-control and the basis for the trust imperative in today's military. A person of integrity practices justice. Those who do similar things must get similar rewards or similar punishments. Service before self tells us also that a good leader places the troops ahead of his/her personal comfort. We must always act in the certain knowledge that all persons possess a fundamental worth as human beings. We demonstrate uncompromising ethical conduct and moral behavior in all of our personal actions. We are loyal and accountable to the public trust. We exist to serve. We serve with pride. Bearing true faith and allegiance is a matter of believing in and devoting yourself to something or someone. Fulfill your obligations. Doing your duty means more than carrying out your assigned tasks. Duty means being able to accomplish tasks as part of a team. Abide by an uncompromising code of integrity, taking responsibility for our actions and keeping our word; Fulfill or exceed our legal and ethical responsibilities in our public and personal lives twenty-four hours a day. We will have: courage to meet the demands of our profession and the mission when it is hazardous, demanding, or otherwise difficult. Exhibit the highest degree of moral character, technical excellence, quality and competence in what we have been trained to do. These are not words that any member of the services take lightly. The veterans who served our country and are now serving their communities carry these words with them as they do their new duties in practicing honor, courage, integrity, selfless service, responsibility, and respect in serving and protecting.